Well, hot dog! 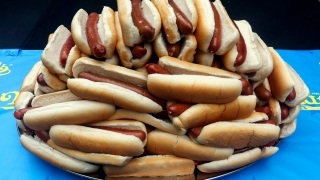 Put your leftovers back in the fridge because today is National Hot Dog Day! A celebration of a true American classic, this food takes families back to a time of barbecues and baseball games. Rather than indulging in a sub-par meal for supper, swing by one of these top Bay Area sausage stops. Vegetarians are welcomed as well, with all restaurants offering meat free options. Rosamunde Sausage Grill is a perfect post work stop. With locations in Oakland, Mission and Lower Haight, guests can craft a custom hot dog. Other options include curry wurst or a sausage plate. Be sure to check out their beers on tap too, because nothing goes better with bratwurst than a cold one. During the 1960s, Berkeley was hosting the Free Speech Movement, housing hippies and... making quality hot dogs? Established in 1966, the eatery has presented a place to curb late night cravings for over 50 years. Top Dog is never short of customers either. Berkeley’s college student population keeps the American dream alive with hot dogs, fraternities and football games. National food holidays are synonymous with free meals. Freemont’s Dog Haus has pulled through with this expectation, offering two hot dogs for the price of one. Good thing too, because this restaurant has an inventive selection of sausages. We recommend taking a bite of the Old Town Dog which includes a hot dog wrapped in smoked bacon with a chipotle aioli, pickled jalapenos, caramelized onions and cojita cheese. Dog Haus’s Southern California location also ranked among the top hot dog eateries in the country. Hot dogs are an American staple for a reason. If looking to grab a good old fashioned dog, head to Happy Hound in Los Gatos. This diner does not mess around when it comes to their menu. Short and simple, guests can grab a classic hot dog with all the trimmings alongside some fries and a shake. It does not get much better than that.